Reclassifying field using Python wildcard string search? I have a point layer with 900K Tree Point records. In that layer I have field (d_Species) that contains the tree species of each record. I've created a field (SpecieValu) to assign a value (0-3) for each record based upon the species of the tree point. There are hundreds of unique species and so I need to assign values based on a substring in the species field like "oak" or "cedar". How do I use a wildcard search to find a substring and return a value? It looks like you're on the right track, it seems like you're just getting some Python and SQL syntax confused. If you are writing a SQL Expression (such as in a select by attribute or definition query), you would use a wildcard character such as the * in combination with the LIKE (which character depends on your data source and single or multi character). However, in Python, you do not need to do so. When testing for a string in another string in python, it tests for the presence of the provided string, exactly as provided, anywhere in the other string. So in your case it was looking for *oak* in the string, and Quercus rubra - northern red oak does not contain *oak*, so it didn't return 3. Instead, just get rid of the * and it would find oak in Quercus rubra - northern red oak. Additionally, your screen shot looks like capitalization should not be an issue as the word your searching for should just be lowercase, but, it should be noted that if you do if 'oak' in 'Quercus Rubra - Northern Red Oak': (note the capitalization), it would not find that if statement to be true and so wouldn't return 3. Therefore, to be safe, you may wish to re-write it like if 'oak' in d_Species.lower(): to avoid missing anything where the capitalization is mixed or upper case. Not the answer you're looking for? 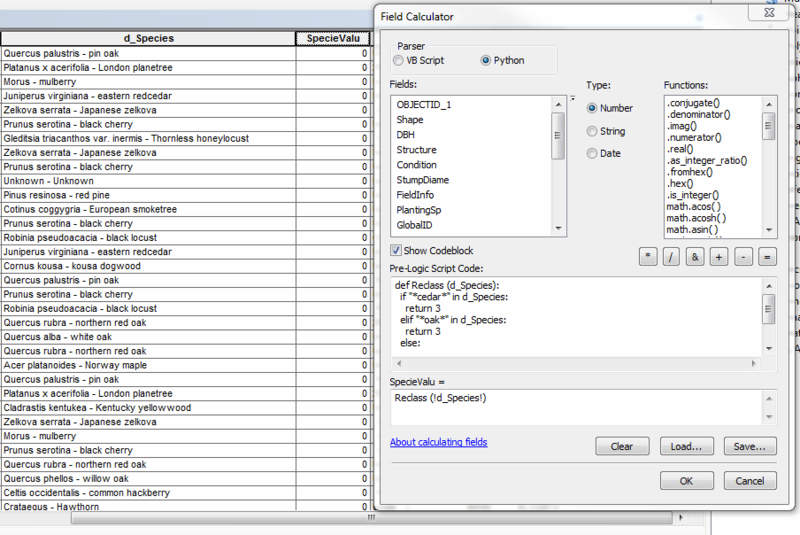 Browse other questions tagged arcmap field-calculator python-parser reclassify wildcard or ask your own question. Manually sorting features in ArcGIS according to field other than what is being symbolized? Writing Python code block in field calculator? Using Calculate Field tool to make empty field be populated with adjacent field's data?